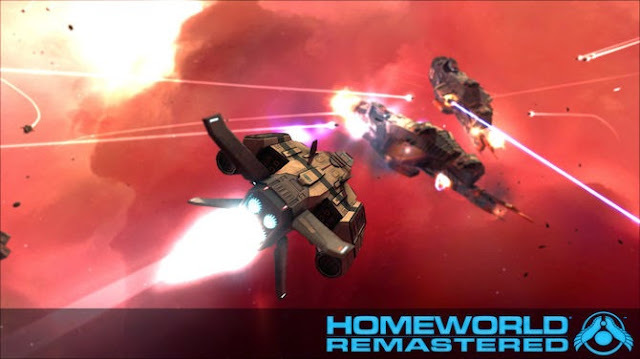 In this beginner's guide you learn something about the important spaceships in Homeworld Remastered Collection. The Scout (dt. Reconnaissance) is one of the most important units in the game. They are used for reconnaissance and make it possible to detect enemy fleets early. They are quick and inexpensive to manufacture, making itself little damage but are highly manoeuvrable. So they are struck by the large vessels rarely. The Interceptor (dt. Interceptor) is quasi the revised version of the Enlightenment, but which is not as effective. This is mainly due to the speed and the higher construction costs. So the interceptor against normal spaceships or even hostile reconnaissance due to the low speed is useless. The Defender (dt. Defender) is one of the starship types that should you build especially for resource degradation processes. Not to break down the raw materials themselves (which makes the collectors), but to protect the collector. Although they are quite slow, but relatively agile and can make a good defensive "wall" in the crowd. However, their weakness is that they do not withstand hits long. The Attack Bomber (dt. Attack Bomber) is an appropriate spaceship class to fight large frigates or generally larger spacecraft. The high firepower is a significant advantage, but the attack bomber is slow in shooting. So they might give to smaller, faster and more agile offensive spaceships to battle him not necessarily. The Fighter (dt. Battle spaceship) is quasi the balancing act between the Scout and the Interceptor. He's fast, holds quite a lot and tells you out relatively well. In crowds a good alternative to fighting to decide quickly to his advantage. Against Corvettes they should however not be flying that goes quickly in the pants. The Corvette (dt. Corvette) is slow but quite a tough nut to crack in space battles. Although no masses worth of standard Corvette, but it should be enough against smaller spaceships yet. Missile Corvette's are equipped with the standard Corvette but no suitable opponent. The main spacecraft unit in space battles (especially in multiplayer mode) are not battleships, as the Fighter or similar, but the Scouts. - As I spy with the Scout? The Scout is designed to make the opponent and its positions identified. So can also quickly make a rough picture of what he's up to next. Sets forth at the beginning 2-3 scouts and let them in the presumed direction of the opponents flying. It is best, if you do maneuvered far below or far above the standard ceiling height. The Scouts have a wide field of view. But let them not too long without protection alone, the enemy is of course also be able to track her down. - As I spy with the normal probe? The normal probes are prima suitable to check the monitor "flanks". Build and send them lived far below or far above the normal ceiling height on the flanks, and see what the enemy is driving possibly there. Also suitable are the normal probes for the scout fields of resources, so Asteroids. You can also start with them kamikaze trips and send them directly into the enemy base for valuable information. - As I spy with the probe distortion? This probe will cost 500 commodity units but with the strongest probe in the game, because it can be very difficult to detect, and if, then only through appropriate anti-probes or the like. Far above or below the normal height spaceship is the chance to be discovered even lower. It is also helpful, then send them directly into the "base" of the opponents, since many opponents do not prepare to be spied directly within the intergalactic four walls.